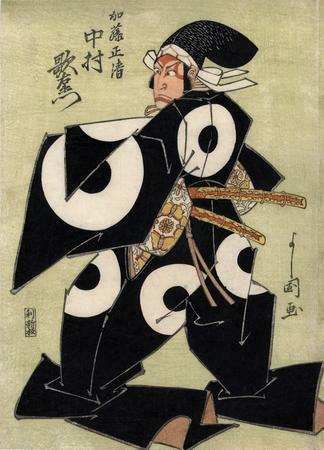 There are three prints in the Lyon Collection showing Utaemon III as Katō Masakiyo. Each shows him in the same dramatic costume and is said to date from ca. 1820. The other two are by Hokushū. While the white circles are the most noticeable element on Masakiyo's outfit they almost distract attention away from the butterfly motif of his obi. 1) In black and white in Ukiyo-e Masterpieces in European Collections: Musées Royaux d'Art et d'Histoire, Brussels, vol. 9, Kodansha, 1989, p. 205, #19. 2) In Ikeda Bunko, Kamigata Yakusha-e Shusei, (Collected Kamigata Actor Prints) volume 1, Ikeda Bunko Library, Osaka, 1997, no. 311. 3) In color in 原色浮世絵大百科事典 (Genshoku Ukiyoe Daihyakka Jiten), vol. 9, p. 122.